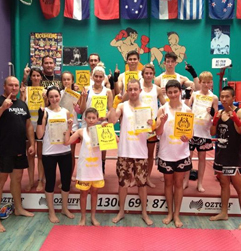 Ultimate curriculum for Muay Thai is graded using a singlet system. After years of training, Ultimate's curriculum is designed to test you to your limits, with an emphasis on technique and fitness. Ultimate's grading is based on all aspects learnt in a Muay Thai class. Therefore only those willing and wanting to grade can achieve this goal on any set grading day. Generally a grading is ran on a Saturday morning every few months. All graders receive their coloured singlet and certificate on completion of the grading.